We propose a class of strongly efficient rare event simulation estimators for random walks and compound Poisson processes with a regularly varying increment/jump-size distribution in a general large deviations regime. Our estimator is based on an importance sampling strategy that hinges on the heavy-tailed sample path large deviations result recently established in . The new estimators are straightforward to implement and can be used to systematically evaluate the probability of a wide range of rare events with bounded relative error. They are “universal” in the sense that a single importance sampling scheme applies to a very general class of rare events that arise in heavy-tailed systems. In particular, our estimators can deal with rare events that are caused by multiple big jumps (therefore, beyond the usual principle of a single big jump) as well as multidimensional processes such as the buffer content process of a queueing network. We illustrate the versatility of our approach with several applications that arise in the context of mathematical finance, actuarial science, and queueing theory. Chen, B, Blanchet, J, Rhee, C.H, & Zwart, A.P. (2017). 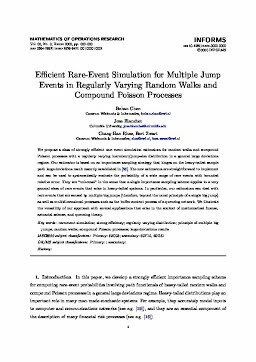 Efficient rare-event simulation for multiple jump events in regularly varying random walks and compound Poisson processes.